What is The Inner Compass? 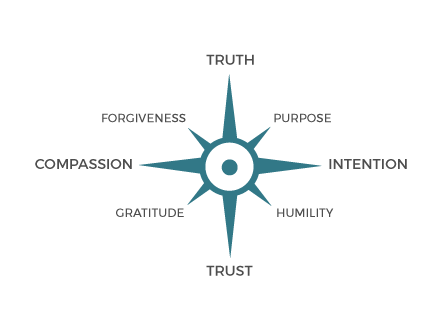 The Inner Compass represents an experiential path towards self-discovery and an enhanced sense of intuition (connection with inner self). By positioning this experience in the context of leadership, the journey along that path becomes one of personal as well as leadership development. This path leads to a solid platform on which to build truly authentic leadership. By exploring in an experiential manner the truth about your purpose and values, as well as your talents and responsibilities, you answer the question why someone should CHOOSE to follow you. By digging even deeper into who you are, the letting go of limiting beliefs allows you to grow and to be who you were always meant to be. As The Inner Compass represents an experiential path towards self-discovery and an enhanced sense of intuition you cannot just think your way through it. You have to experience it. This being said, the programme for The Inner Compass does start people off in a 'thinking mode' to gently ease them into the process. This is purposely done to build a bridge for people, who may be dependent on their logical thinking mode. The programme is based on individual reflection along with mindfulness exercises and meditation sessions related to real leadership challenges. The goal is to sense and feel what is right in a given situation (use intuition) rather than arriving at conclusions through logical thinking. As the programme advances it becomes more experiential by, for example, emphasising how participants can proactively change their state of mind and quiet it down, in order to gain stillness, clarity and insight. This process aim to develop the delegate as an authentic conscious leader. We have a purpose built venue located on Iceland’s south coast offering modern meeting facilities, breakout areas, a cosy fireplace nook, a kitchen and a private outdoor area that we use to deliver Inner Compass Leadership Retreats. The retreat venue is called Eirð (Pron: Aerth) - which is an old Icelandic word that stands for inner peace and tranquillity. This fits in with the Inner Compass philosophy. At Eirð we support both individual managers and teams in developing a conscious approach to leadership, resulting in deep and lasting personal connections and sustainable business strategies. The Inner Compass is an experiential path towards self-discovery and an enhanced sense of intuition.